The triple King bedrooms are very comfy and cozy. Check out the beautiful river rock wood fireplace! Open concept living and dining area. Large flat screen TV in living room, and TV's in all three bedrooms are an added bonus. Enjoy this comfortable cabin, with its well set up deck, featuring hot tub, roomy outdoor dining table and gas grill! The triple King bedrooms are very comfy and cozy. Check out the beautiful river rock wood fireplace! Open concept living and dining area. Large flat screen TV in living room, and brand new flat screen TVs in all three bedrooms are an added bonus. *Winter Snow Conditions will require 4wd or chains! The Hill Top cabin was a wonderful place to stay. The area is quiet, the hot tub relaxing, the deck perfect for breakfast while watching deer and many different birds and the cabin was very clean and comfortable. Exceeded expectations. Had never been to the Ruidoso area. 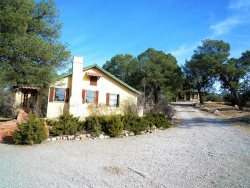 The cabin was conveniently located to downtown, shopping and area attractions. The cabin was very clean and the kitchen stocked with everything needed for cooking. The location was private, very well appointed and easy to find. The hot tub was spotless and easy to access. All 3 bedrooms had beautiful king-sized beds and cable TVs. There were deer and woodpeckers to watch from the deck, and no outside noise to disturb our peaceful vacation!